A New Hope is #8 in the Thunder Point series. It takes up the story of Ginger Dysart, who has been staying with Ray Ann and healing from a broken marriage and losing a child. She has found a job working for Grace in the local florist shop. The book opens at the Lacoumette farm where the wedding of Scott and Payton is taking place. One of Payton's brothers - Matt, makes a nuisance of himself with Ginger and she floors him! He too is recovering from a broken marriage and something else which has led him to not being his usual self. When he realises what he has done he seeks out Ginger at Thunder Point and apologises. And the romance develops from there. Ginger is a wonderful character, she has grown through her grief and her eyes are wide open. She is learning to be direct and speak her mind. Loved that about her. She still is dealing with her ex as well as the anger that Matt is carrying, and she is not prepared to just put up with it. Matt to give him his credit is a very likeable character, a little henpecked by his sister if he allowed it, and ready as time goes by to engage in a new relationship. I thought Robyn Carr took an excellent line with this character, it was great to witness. I won't give anything away because I don't want to spoil the journey for other readers. While Ginger and Matt are the two main characters in focus, I love how we are given glimpses of some of the other characters. Another marriage takes place, so continuing the story of two previous characters. I especially enjoyed Winnie's story (the mother of Grace who has come to live with her) and her nurse Lin Su and her son Charlie. The next book is going to track their story and I just can't wait because I just know its going to be good. I so love these stories because they are more than romance. They include a wide range of characters, young and old, each with a story and challenges of their own. The books have substance. I STILL have not tried a Carr book, but I have meaning to for ages. I love what I have read of Robyn Carr. I am only on the third book of the Virgin River series and I own the first in this series, which I wont get to until I finish Virgin River. So far I am finding all of her men super manly without being egotistical, and the woman feminine without being weak, which I love. Like you said, it is more than just romance, which is nice. That's why I like Debbie Macomber's Cedar Cove series. I love the romance, but need something more to really enjoy it most of the time. I loved all the Virgin River books. Yes for me the book has to be far more than a romance. 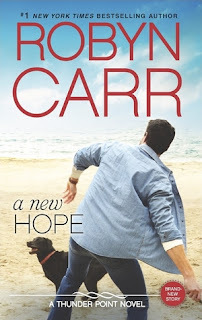 I like romance but I want more and Robyn Carr does that. I have read Macomber's Blossom St books but not much of her Cedar Cove. Maybe one day!